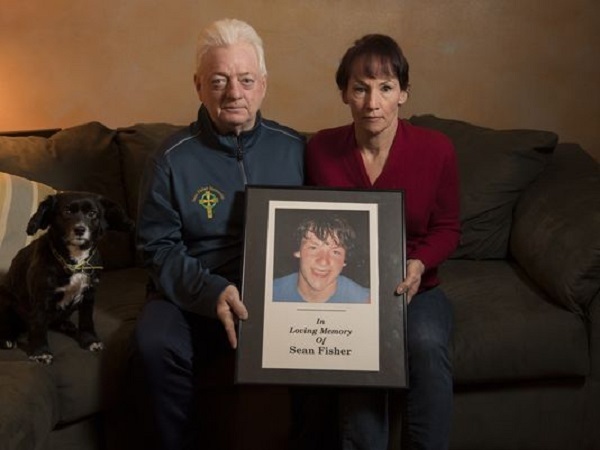 WALDWICK — Just weeks before he turned 13, Sean Fisher's father Jim says he had to give up playfully sparring with his growing son. The multisport athlete was getting strong – a heavy boxing bag would have to take the place of his old man, Jim Fisher decided. But despite a thriving outward appearance and unbeknownst to everyone, Sean had hypertrophic cardiomyopathy, a heart condition caused by a thickening of the heart muscle. At football practice on Aug. 25, 2008 – his 13th birthday – he went into cardiac arrest, collapsed and died. "It's every parent's worst nightmare," Jim Fisher said. In the years since their only child's death, Fisher and his wife Sheila have advocated for early detection of sudden cardiac arrest – the number one killer of student athletes, according to the Mayo Clinic. Now, they're teaming up with a New Jersey soccer academy for a new mission: to ensure every youth coach in the United States is trained in CPR and has access to a defibrillator. After Sean’s death, the Fishers channeled their grief into action, starting a foundation in their son’s name. Some 3,000 student-athletes from Waldwick, Paramus and Wallington have been screened for heart abnormalities thanks to their efforts. But as news of kids dying from sudden cardiac arrest continued to rock communities across the country – a 16-year-old Holmdel High School student collapsed and died during a lacrosse game last fall; a Georgia boy, also 16, died during soccer practice last summer – Jim Fisher felt there was more work to be done. He began talking with longtime friends Mike O’Neill and Gerry McKeown, program directors at the Players Development Academy, an elite youth soccer club based in Somerset. The group then brought Dr. Nidhi Kumar, a cardiologist and Director of Women’s Health at Saint Peter’s University Hospital in New Brunswick, to the table. The group soon decided screening was not enough. Exams were too expensive to make a large-scale program realistic and besides, screening might not catch all defects, giving parents a false sense of security, Kumar said. What athletes really needed, they realized, was access to immediate treatment. When someone goes into cardiac arrest, every second is critical. The likelihood of death increases by 10 percent for every minute that a patient goes without defibrillation, according to Kumar. Waiting for first responders to arrive after dialing 911, then, may simply be too late, Kumar said. But coaches, she said, are generally no more than 100 feet from players. “To have a coach there that has an education and equipment to be able to respond makes the chance of surviving significantly higher," said Kumar. School districts in New Jersey are required to keep an automated external defibrillator on school property and within reasonable proximity to gyms and athletic fields. A coach or staff member must also be trained in CPR and use of the defibrillator. Larry White, executive director of the New Jersey State Interscholastic Athletic Association – a nonprofit that represents high schools across the state – said the requirement has saved at least seven or eight student-athletes’ lives since its enactment in 2012. But no such requirement exists for club and recreation leagues, where less than 30 percent of youth coaches are trained in CPR, according to a Sports & Fitness Industry and Aspen Institute report. That's where the Fishers' new initiative, dubbed All Heart, comes in. The program strives to train coaches to be first responders, instructing them in CPR and equipping fields and courts nationwide with life-saving defibrillators. So far, nearly 100 coaches from the Players Development Academy have been trained in CPR at a simulation center at Saint Peter’s hospital. They plan to challenge other soccer academies across the country to do the same, in hopes that more youth sports leagues take up the effort. There is a cost associated with the training – $100 per coach at Saint Peter's – and defibrillators cost up to $2,500, Jim Fisher said. But with fewer coaches to train than student-athletes to screen, program leaders are confident All Heart is sustainable. “We’re trying to make sure coaches understand and embrace the role they play – that they can save a life,” O’Neill said. For Jim Fisher, the work offers a sense of healing and purpose. A hardened New York City union carpenter, now retired, he wells with tears when talking about his son, whom he describes as friendly, without a mean bone in his body. In addition to the extensive work the Fishers have done through their foundation, they have called for all kids going into eighth grade to be required to undergo a physical examination with a heart health component – not just student-athletes, as state law currently mandates. “This is therapy for me,” Fisher said of the work he and his wife are doing. “The day Sean died was the worst day of my life. I keep going because it’s what Sean would’ve wanted and we don’t want to see any other parents go through what we have." SafeBeat has been featured by ABC News, Fox News, The Tampa Tribune, St. Petersburg Times, Tampa Bay Online, EP Lab Digest, South Tampa News & Tribune, and publicly endorsed by Former NFL Coach Tony Dungy.